Femke van Gemert creates tapestries, wall-hangings, wallpanels and installations made of 100 % recycled textiles. They can be works on commission, site specific designs with the use of discarded textiles from various sources. She does because of a very strong conviction that we need to reconsider waste. Knowing the intense effect on the global environment and human labour conditions the textile and fashion industry has, Femke decided to not use any virgin materials for there artworks. She constantly works on a range of autonomous works. For Femke working with discarded fabrics and textiles is a continuous study and experiment of what she can do with these leftovers of our intensive consumer society. Resulting in art pieces made in various techniques that explore the possibilities of textiles in 2 and 3-D and in voluminous reliefs. “Every piece of textile has been designed, produced, and worn or used otherwise. Therefore, every piece of textile has a story, a particular atmosphere and beauty. 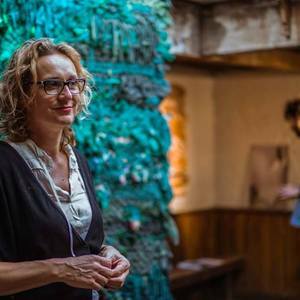 Every piece of textile that I use has been eaten, digested and discarded by society.” Femke van Gemert creates unique, handmade and sustainable art objects from discarded textiles, taking the form of textile wall panels, tapestries, installations and site-specific soft wall coverings. Her work catches the beauty of imperfection and decay and by its tangible nature often evokes strong emotions with the viewer. “I’m not trying to improve the already existing fabrics I gather. It’s more that I want to create something that doesn't exist yet with the use of what is already there.” Combined in a new frame the used fabrics tell a new story, filling any room with a certain mood while on a functional level improving the acoustics. To make commissioned works even more personal, Femke can work with the commissioner’s own leftover textiles. Several publications in: Textiel Plus, FD Persoonlijk 2013, MInd Magazine China 2014, Bamboo magazine Brazil 2015, Arte1 national Brazilian tv, de Telegraaf the Netherlands and several other blogs, websites etc.